I first read "Pecan Pie" cover to cover in one big gulp on a plane ride from California. It was a fast paced, easy read that I was able to fit between chats with fellow passengers on my flight home. That ravenous consuming of "Pecan Pie" was about a year ago. I have been craving a re-read of the book, but planned this time to savor the chapters more fully. Each of the book's chapters - slices of pie - is 2 to 4 pages. I decided I would chew each slice slowly and then allow a few days for the "pecan" of wisdom it contained to digest fully before starting the next slice. Using this approach, my second helping of "Pecan Pie" took me almost three months to finish. After reading each chapter, I made notes and pondered the lesson from that chapter for a couple of days. What amazing concepts I absorbed from this repeat course of "Pecan Pie." The book has few pages, however it reinforces the concept that good things come in small packages. If you will let it, Bob's book can lead you to some marvelous personal insights; great ah ha moments. You owe it to your future to read this book. I have read literally thousands of books; few warranted a second reading. I have now read "Pecan Pie" twice and will likely read it many more times. Thank you, Bob Gambone, for such delectable, easy to digest ideas we can implement for our success! Pecan Pie, Best leadership book I've read! Pecan Pie is a must read for all that are in or inspire to in any type of leadership role! It is easy to read with powerful short stories with great lessons. Thank you Bob for sharing your wisdom with us! I have recommended this to several and will be buying several copies as gifts for all my managers! I purchased "Pecan Pie" from Bob Gambone in May, and I decided I would take my time to read through it as my business progressed. I am in my first year of business as a Chiropractor which tells you that "business" is not my strong point. Before I purchased the book, I was always looking for advice and information on "what shall I do now?" I have found that every story Bob tells or every important point made in the book has helped me in some aspect of, not only my work, but my life. I can't say enough about this book and how it has helped me make decisions in my business. Thank you Bob! Let me give you my conclusion first. Bob Gambone has whipped up a culinary masterpiece with his very first book. Pecan Pie is a rich dessert. It should be required eating for every entrepreneur who wants to realize his full potential. Bob is not one of those self-appointed gurus dispensing the highest wisdom from the mountain top. Those folk give me a rash. Bob offers true wisdom gained from his many years as a change agent within one of the largest retail food companies in the nation. His advice is simple yet profound; it arises from his business acumen, his knowledge of and compassion for people, and his ability to draw you into his life and empower you to take up your business with greater understanding and renewed energy. Buy this book! Taste the wisdom within. And watch your business grow! 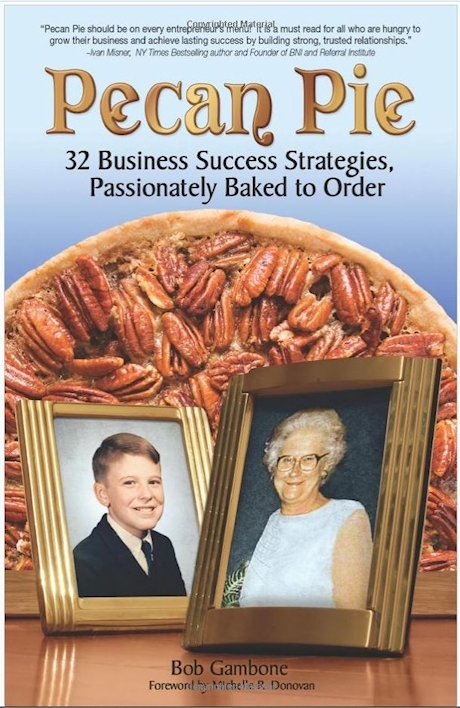 ~Neal Griebling, Future Design Studio, Inc.
Pecan Pie: 32 Business Success Strategies is an easy read. In fact, you could read it in day! That is what I was told when I purchased the book. And you could read it in day, but don't! The information in this book is so valuable you will want to read it over and over as it soaks into your soul. Just like a great piece of pecan pie, you won't want to waste any of the content without letting them roll over the taste buds of your mind. Take notes so that you can put into practice these strategies as if they are a part of your personality. Don't waste a crumb!